Arthur Hughes (1832-1915) was an artist and illustrator from England. 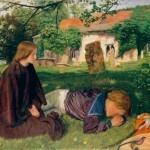 He was affiliated throughout his career with the Pre-Raphaelite Brotherhood. 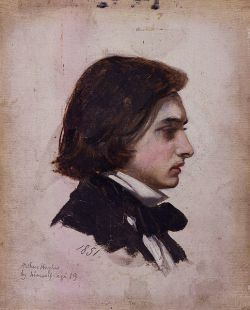 He was only 18 when the Brotherhood was founded by William Holman Hunt, John Everett Millais and Dante Gabriel Rossetti. The group never opened up membership after its founding and several artists, like Hughes, who were associated with the Brotherhood never became full members. According to Wikipedia, “They believed that the Classical poses and elegant compositions of Raphael in particular had been a corrupting influence on the academic teaching of art.” The group strove to return to the abundant detail, intense colors and complex compositions of Quattrocento Italian and Flemish art. Hughes died in 1915. 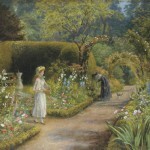 His legacy included about 700 known paintings and over 750 book illustrations. 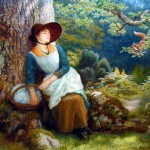 Unfortunately, Arthur Hughes was never formally accepted into the pre-Raphaelite Brotherhood. This large, scholarly work on the movement only gives Hughes but a few pages. 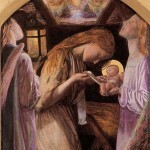 But, it does offer students and art enthusiasts a master class on the pre-Raphaelite movement, it's key members and the distinctive characteristics of pre-Raphaelite works.